In addition to the format switch-up, we also introduced some podcast equipment into the room to capture the talks and the follow up discussion. Below, you'll find links to the audio for each talk along with some notes the IWST organizers put together to help people follow up on some of the topics discussed. 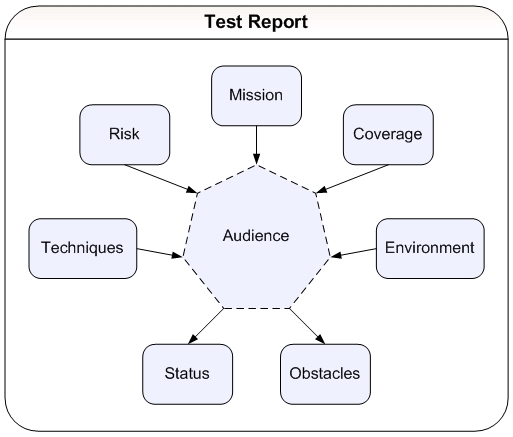 Dimensions of a Good Test Report: article on applying the MCOASTER heuristic to test reporting. Past blog post on coming up with a heuristic. The basics of Scrum on Wikipedia. Checkout the TWiki website for more information on that tool. Checkout the Bugzilla website for more information on that tool. The MoSCoW acronym on Wikipedia. Checkout the Subversion website for more information on that tool. Checkout the Selenium website for more information on that tool. One of the (many) Jason Huggins Google tech talks on Selenium. Checkout the uTest website for more on crowdsourcing. The topic of using emulators for testing came up during the discussion. This post contains a nice listing of some emulators out there today with links for where to find them. During the discussion, the previous workshop on Testing Centers of Excellence was mentioned. A bit more on supercookies from 33 Bits of Entropy. Checkout the Stella website for more information on that tool. Checkout the Website Grader website for more information on that tool. Checkout the BrowserMob website for more information on that tool. Checkout the spoon website for more information on that tool. Checkout the WebPagetest website for more information on that tool. Checkout the Browsershots website for more information on that tool. Checkout the Web Developer extension website for more information on that tool. During the talk Mike mentioned the concept of blink testing. Checkout the QuickTestingTips.com blog for short writeups on these (and similar) tools. Jason works for BlueLock, a company that offers hosting/services for the cloud. You can learn more about their products on their website. Jason mentioned VMware and Microsoft Hyper-V as examples of private clouds. You can find the Aspire ROI calculator on their website. Mike mentioned that this content was co-developed with David Christiansen. For more on all pairs testing (and other combinatorics techniques) checkout the Pairwise Testing website. During the questions and answers, Pat Milligan mentioned the tool Hudson. Learn more about Hudson and continuious integration on the Hudson website. If you've not see the movie, check out the Omega Man. Also mentioned as a useful metaphor was Arrested Development. James Bach's article on The Omega Tester. Checkout the Balsamiq website for more information on that tool. Checkout the Atlassian website for more information on Confluence, JIRA, GreenHopper. Checkout the Maven website for more information on that tool. Checkout Dan North's website for more on BDD. If you like the format, you're in luck... We think we'll be doing something like this a couple times in 2011. Enjoy the audio and if you have any questions or suggestions let me know. You can also help us plan the 2011 workshop topics on the IWST Meetup site, under Ideas. I've started adding selected IWST talks from the 2010 workshops to the Testing Podcast. You'll start to see them come out once a week for the next several weeks. Going forward, when podcast material becomes available, I'll be posting that content on both the IWST website and Testing Podcast.